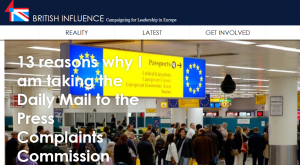 Over 80 complaints to the Press Complaints Commission against the Daily Mail’s story that incorrectly claimed buses and planes to the UK from Romania and Bulgaria were ‘full-up and sold-out’ have been rejected and not upheld. 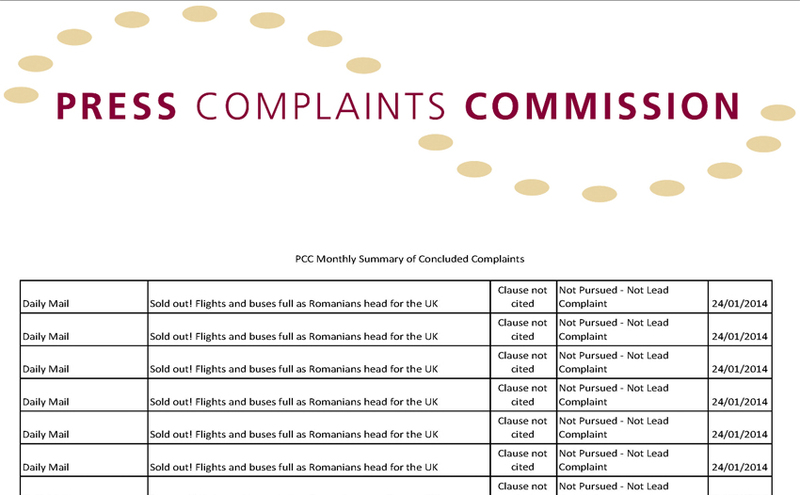 The PCC’s ‘Monthly Summary of Concluded Complaints’ for January 2014 has just been published on their website. The complaints against the Daily Mail were rejected because, the PCC claimed, the relevant clause ‘was not cited’; the complaint was ‘not pursued’; or the complaint was ‘not the lead complaint’. 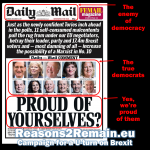 It was, it seems, a complete waste of time for those 81 people who complained to the PCC against the Daily Mail’s story. In fact, of 495 complaints received by the PCC during January against newspaper stories, only one was upheld. Tomorrow I will endeavour to find out what has happened to my complaint against the Daily Mail sent to the PCC, as I certainly cited two clauses – 1 and 12 – of the Editor’s Code in my complaint, and I certainly made clear to the PCC that my complaint should be pursued. I cited 13 reasons for my complaint. The PCC investigation into the Daily Mail’s article has not yet been concluded; the result of the PCC investigation should be announced this week. I asked why 81 complaints about the Daily Mail article were listed on the PCC website as ‘concluded’ when the PCC investigation was still ongoing? The Complaints Officer agreed with me it was confusing. I have been promised a further response later this afternoon. “The PCC received 83 complaints about the article “Sold out! 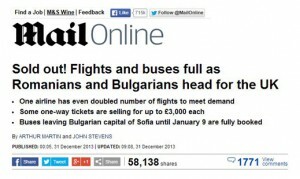 Flights and buses full as Romanians and Bulgarians head for the UK”, published by the Daily Mail. A lead complainant was selected for the purposes of a PCC investigation. Individuals making subsequent complaints to the PCC were informed that we were already investigating the article following an earlier complaint, and that they would be updated regarding the outcome of the investigation in due course. 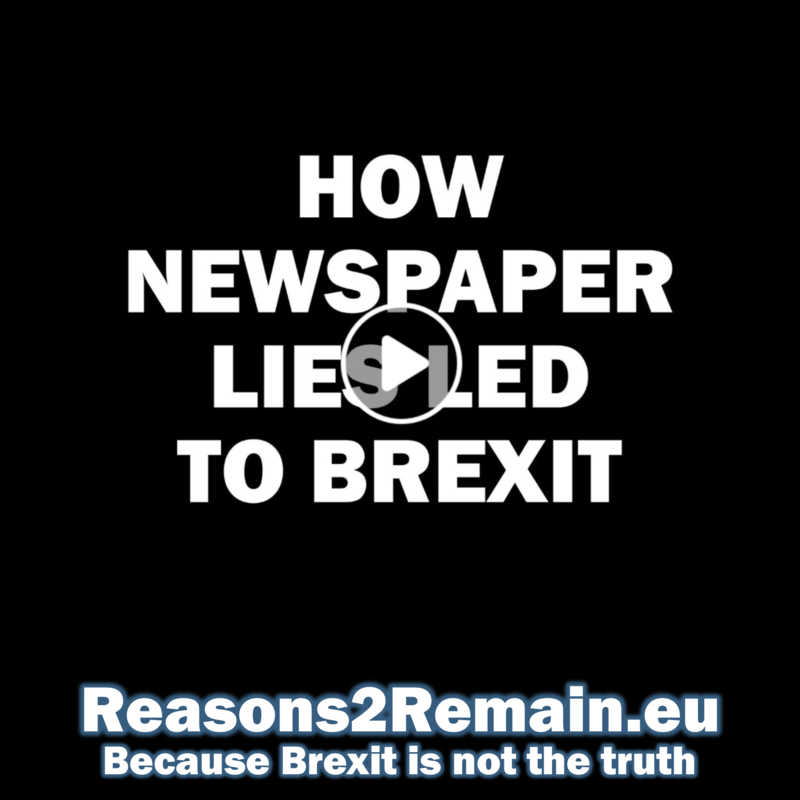 I note that you were sent an email on 22 January by Lauren Hay, Complaints Assistant, that stated: “We are currently investigating this article following an earlier complaint. We will let you know the outcome of our investigation when we can”. While that investigation has not quite been concluded, we hope to inform you, and the other complainants, of the outcome of the investigation later this week. You raised further questions about the manner in which the PCC recorded the complaints in the “PCC Monthly Summary of Concluded Complaints” published on its website for January 2014. Complaints about an article which is already subject to a PCC investigation are recorded as “Not Pursued – Not Lead”, in order to reflect they are not the lead complaint, but that the PCC has investigated (or, in this case, is investigating) a complaint about the same material. This does not signify that the complaint has been rejected or indeed that the Commission has made any ruling on the complaint. “Thank you for your response and I will update my blog accordingly. Can you please tell me how the PCC chooses the ‘lead complaint’? Is it the first complaint received, or is there another method for the PCC to choose the ‘lead’? Can you please let me have a copy of the lead complaint and the date it was received? 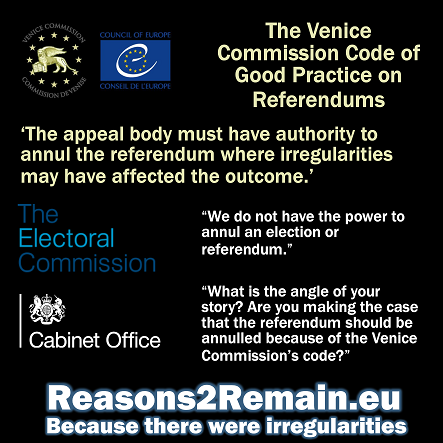 Will all the issues specifically raised in my complaint – which are likely to be more in-depth than any other complaint received by the PCC – be fully considered and investigated, even though my complaint was not the lead complaint? Where is my complaint listed on your database? I counted 81 complaints listed in your January database of ‘concluded complaints’ If there were 83 complaints in total as you stated, and the lead complaint isn’t listed on your January database, where is complaint number 83? Your Complaints Officer Elizabeth Cobbe agreed with me that it’s confusing for the PCC to list complaints as ‘concluded’ when the actual investigation into the issues raised by those complaints is not yet concluded. Can you please explain why the PCC doesn’t make clear that the investigation is ongoing? I believe that anyone reading your website would consider that indeed the 81 complaints have been concluded and not upheld (i.e. rejected). Thank you for your further emails. The process of selecting a lead complaint depends on the particular circumstances, but it is generally the first complaint the PCC receives about an article that outlines concerns that raise a potential breach of the Editors’ Code such that an investigation is required. In cases where we receive a very large number of complaints at the same time, we will generally try to select an individual whose complaint best encapsulates the significant issues raised by the complainants as a whole. I am afraid that we cannot provide details of another individual’s complaint to the PCC, for reasons of confidentiality. If you consider that the outcome of the investigation into the lead complaint does not address all the concerns you raised, you are entitled to request that the Commission make a ruling on your specific complaint. The Complaints Summary to which you refer reflects the position as of the end of January 2014. It does not list complaints made in February or March 2014. The Complaints Summary does not state that the 81 complaints have been rejected. As you will note from other complaints listed in the summary, such complaints are recorded as “no breach”. We are always happy to clarify any terminology which visitor to our website may find unclear. I had assumed that the 81 complaints listed for January had been rejected, as these complaints were on a list of ‘concluded’ complaints. Why list those complaints as ‘concluded’, when the investigation hasn’t been completed? 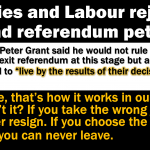 I would appreciate further clarification as it simply doesn’t make any sense to me. Regarding giving me the details of the lead complaint, I don’t need to know who the complainant was; I simply need to know specifically what were the issues raised in the ‘lead complaint’? Are you able to provide those details? Surely the issues raised in the ‘lead complaint’ will have to be made public by the PCC? If the 13 issues I specifically detailed in my complaint were not included in the ‘lead complaint’, should I conclude that your investigation will not address all my 13 concerns? If so, I wish now to request that the PCC specifically makes a ruling on all13 of my detailed reasons for complaining. Otherwise, this matter is simply going to be protracted unnecessarily. I had asked where my complaint is listed on your database? My complaint was submitted in January 2014, but I cannot see that my complaint could be one of the 81 complaints listed in your January database. That’s because all the 81 complaints listed in your January database states that ‘clause not cited’. I assume this means that those complaints did not specify one of the Editor’s Code of Practice. However, my complaint specifically cited Codes 1 and Code 12. So where is my complaint listed on your database? Finally, your colleague indicated that the PCC’s ruling on the Daily Mail story, “Sold out! Flights and buses full as Romanians and Bulgarians head for the UK” should be made this week. Is that still the case? I look forward to your further reply which, for the sake of openness, I will again publish on my blog. 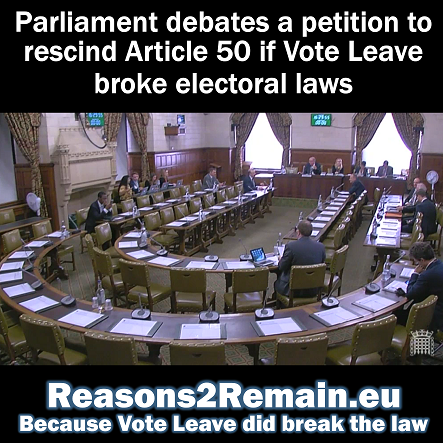 This entry was posted in Current Affairs, Democracy & Citizenship, Law & Justice, Media & Communications, Politics & Public Policy, Publications & Events, Society & Culture, The EU and tagged Bulgarians, Daily Mail, EU, European Union, free movement, Jon Danzig, journalism, PCC, Press Complaints Commission, Romanians. Bookmark the permalink. Previous: David Cameron’s alternative Union speech? I am not surprised. I made complaints in the past against DM for anti-Romanian statements in the past and the complaints were either rejected, or simply not registered and not answered. I also wrote a very similar letter to Jon Danzig’s Romanians on planes/buses, etc. I cited all relevant clauses I felt the DM’s article breached. I have not had any acknowledgement of my complaint. I find this section of the PCC’s reply to Jon’s letter particularly inaccurate. I have not been informed of anything. I shall endeavour to find out whether I am one of the 83 original complainants, or whether my letter has been lost.